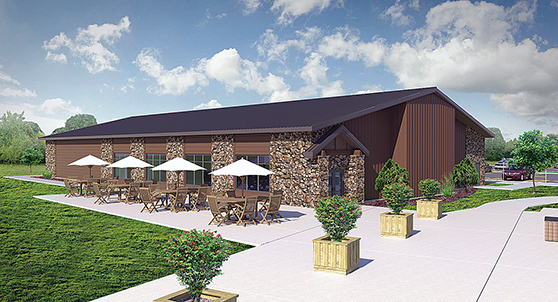 An agreement between Hamilton County and Webster City to support the Briggs Woods Conference Center now under construction was approved by the City Council on Monday. The City Council agreed to the creation of a new urban renewal area of about 40 acres surrounding the conference center. The agreement will not cost the city any money, according to Mayor John Hawkins and Hamilton County Supervisor Doug Bailey. The conference center is in Briggs Woods Recreation Area, south of Webster City on Iowa Highway 17. Even though it is not in the city limits, the council had to sign off on the establishment of the urban renewal area because it is within two miles of the city limits. Iowa law gives cities some oversight of development activity within two miles of the corporate limits. Bailey said the urban renewal area is being created to enable the county to finance projects in and around the conference center. And while setting up an urban renewal area is often the first step to using tax increment financing, that won’t be the case with this one, he said. ”There would be no TIF involved because it’s all public property,” he said. Tax increment financing occurs when increased property tax revenue from a desiginated area is set aside to be reinvested in that area. But the county owns all the property around the conference center, so no taxes are collected on it. The council unanimously approved the creation of the urban renewal area. The Board of Supervisors is to consider the urban renewal area later this month. Construction of the conference center is expected to be completed early next year. Peterson Construction, of Webster City, has a roughly $2.3 million contract for the job. The center is next to the golf clubhouse. Bailey said its main room can seat 350 people. That main room can be divided into four separate meeting rooms. The building also has a kitchen and bar. The center will be available for business meetings, wedding receptions and reunions. ”It has a wide variety of uses and can have multiple uses at the same time,” Bailey said.